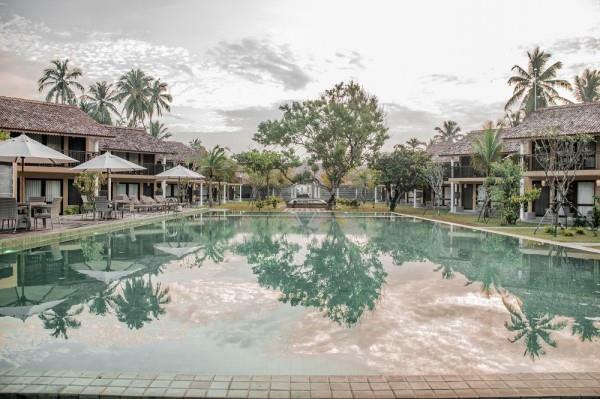 The Villas Wadduwa is your perfect positioning of classical Sinhalese architecture known as a Walauwa. The Walauwa is a colonial manor house of a native and a notable feature of many of these Walauwas, was an interior open space or a garden known as the 'medhamidula' in the middle of the house. Resting on the shores of the southern coast this 32 Villa resort is your summer beach getaway complete with private plunge pools, spa, gym, a golden sandy beach and of course an international fusion of cuisine to keep your taste-buds tingling. Group Operations General Manager Dayal Fernando stated that The Villas Wadduwa was a perfect summer beach getaway complete with a private plunge pool in each luxury room, a spa, a gym and a golden sandy beach. The décor stay true to the theme of the location with light shades and hints of baby blue blending perfectly with its surrounding nature. The off white and antique touch in the wooden flooring, furniture and bed posts resembles the soft sandy white beaches. Each room comes with all the modern comforts & amenities. You can unwind in the comfort of your terrace listening to the waves crashing ashore or clink on your drink while watching the sun go behind the ocean horizon. Step into the Senses Spa and treat yourself to one of our signature treatments from our Ayurveda and Western treatments. If you prefer to break a sweat then step into our gym and workout your stress away. The Villas has two restaurants which includes and all day dining restaurant and a fine dining restaurant located upstairs. Our chefs are prepared to serve you the finest of an international fusion of cuisine to delight your taste-buds. Step into our bar and savour a cocktail with a touch of our local spirits or go international. The Villas is just a 3 hour drive from the Bandaranaike International Airport and you can always arrange a pick up to and from the airport by speaking to our reservations team. For more information log on to www.amayaresorts.com or call us on +94-114-767-888.